Expanding Medicaid Trims Hospitals' Costs Of Caring For Uninsured : Shots - Health News One aim of Obamacare was to ease the financial strain on nonprofit hospitals that provide medical care to people who lack insurance and can't pay their bills. That plan is working, hospitals say. 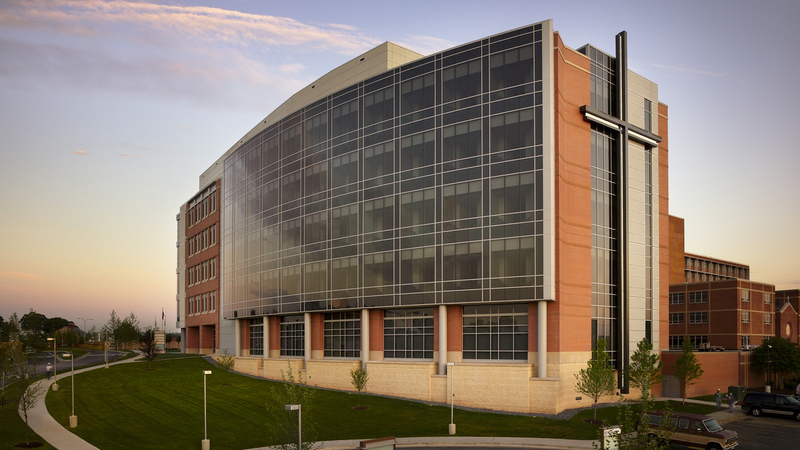 St. Agnes Hospital in Baltimore is one of the 131 hospitals run by Ascension Health. It's a not-for-profit, Catholic health care system that treats many low-income patients. When patients show up in the hospital without health insurance, they often receive charity care — the hospital treats the person and then swallows some or all of the costs. It's central to the mission of many nonprofit hospitals, particularly those serving low-income areas. "That's why we're here, that's what we're all about, and our patients count on us for that care," says Johnny Smith, who represents Ascension Health, a not-for-profit Catholic health care system that operates 131 acute-care hospitals in 16 states and the District of Columbia. Hospitals are able to recoup some of the costs of this care, but it can still put a financial strain on some systems. One of the goals of the Affordable Care Act was to reduce the burden of charity care, which totaled nearly $85 billion in 2013. A new study by the nonprofit Kaiser Family Foundation suggests that Medicaid — a government health insurance program that covers many people who don't make much money — might be doing just that. The study looked at data from Ascencion's network of hospitals. It found that hospitals in states that chose to expand their Medicaid programs under the Affordable Care Act saw a 40 percent reduction in costs for charity care. Hospitals in states that did not expand Medicaid saw just a 6 percent reduction in these costs; they also saw a net increase in the overall cost of taking care of uninsured patients. The researchers also found a reduction in the number of hospital visits by uninsured patients in Medicaid expansion states from 2013 to 2014, the year Medicaid expansion took effect — such visits were down 32 percent, from 7,597 to 5,144. In states that did not expand Medicaid, visits from uninsured patients fell by just 4 percent, from 25,786 to 24,654. The study was not set up to show what caused these dramatic differences, says Rachel Garfield, a senior researcher at Kaiser Family Foundation and co-author of the report. "But the most likely explanation, by far," she says, "is the availability of expanded Medicaid in some states and not in others."